I recently stumbled across the most AMAZING, super cute, super easy to use Gratitude Journal app on the iPhone. One entry a day, you can easily attach a photograph, and you can set daily reminders as well…LOVE this app. I grouped the pages in threes as I wanted them sturdy and thick enough to withstand ink, tape, embellishments, etc. Turn the book over. Cut the corners at an angle. Fold over corner. Fold over tape. 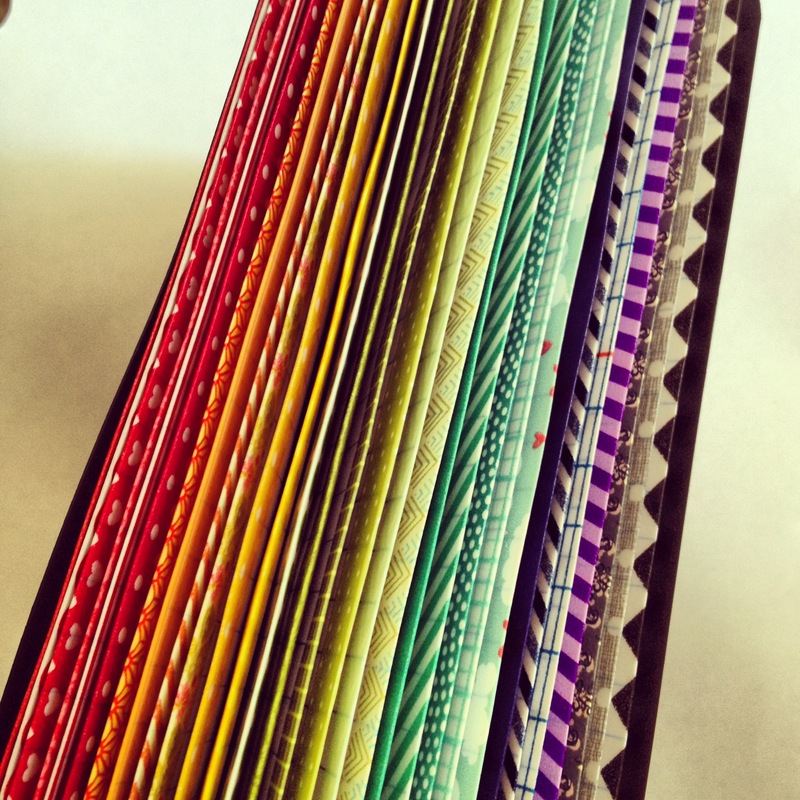 Turn book back over and fold down the remaining pieces of washi tape. The colors make me smile and the lined paper is so much easier for me to work with than the various papers included in the Smash books. I like the simple, clean look of the lined background. Looking forward to adding and working this…not bad for a .37 cent journal!! This is a great! This is going to make perfect journals for the girls in our family. Christmas gift for sure! This is such a cute idea! I’ve been looking for ways to turn my comp book into a smash type journal. Thanks for sharing! Thank you so much for sharing this. I have been wanting to make a journal for my 30 Before 30 list and you have given me the inspiration to pretty it up! This is a great idea! I saw it on Pinterest and wanted to othank you for sharing it!! LOVE this idea! Except, you just “enabled” me to buy MORE washi tape! 😀 THANKS!!! Hi! Wanted to let you know that I’ve featured your post over at Ideas For Scrapbookers. Thanks for sharing your creativity! I have neither used nor purchased washi tape. I do know what it is, but I haven’t had the pleasure of owning any. Where can I buy a lot for the least amount of money? 🙂 Thanks for the project idea! and I know it will help with my scrapbooking and card making. SO cute!! where did you get all of your washi tape? And I’m so pleased with how it looks…and how it makes me feel! I love this so much I had to make one last night! I used a mini composition book–it came out so cute! I gave it to my sister and plan to make myself one tonight. Super cute super fun, I am adding you to my sidebar! Cute idea! I would love it if you joined and contribute your awesome posts at my link party at City of Creative Dreams, starts on Fridays 😀 Hope to see you there at City of Creative Dreams Link Party. Great idea! It really makes the pages look so much prettier! My loose leaf keeps riding in my binder and I’m looking very important notes. I was thinking of saving the notes and when I rewrite them to put washi tape on the edges so they won’t tear of. Then I’ll just add the holes and voila. Do you think that I’ll be strong enough to hold or is there anything you can recommend me? I like how the edges look it would definitely make me want to study just with all the pretty edges. Hi there! What a great idea! Where do you purchase your washi tapes? They seem so popular and yet I can never find them! Thanks!